My wines for this week are two expressions of Etna Bianco that both were awarded a Tre Bicchieri designation this year. Benanti, imported by my friends at Tradizione Imports, Salvino and Marco, is a wonderful producer who makes gorgeous wines. I have been tasting the wines at various events held by their importer throughout the years. 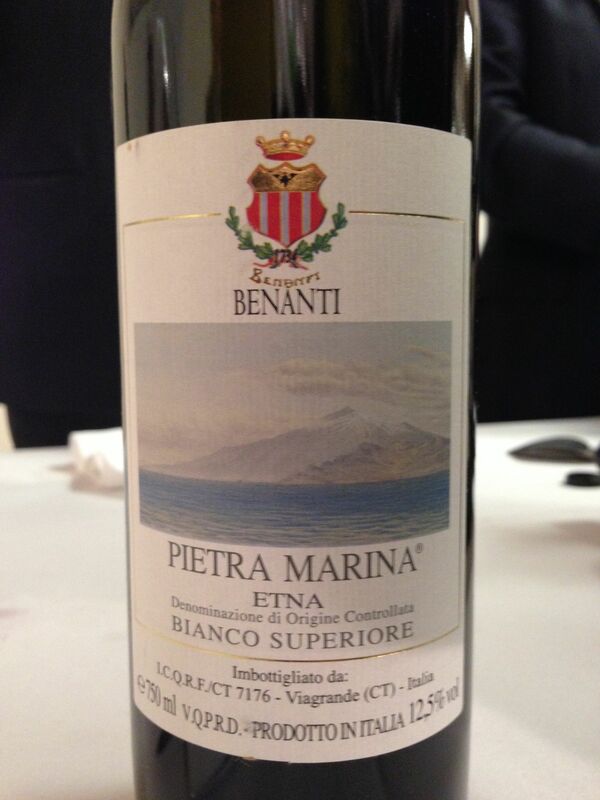 This wine from Benanti, Pietramarina Sup. D.O.C. 2009 is made from vineyards located at 950 meters above sea level. The climate in this area is mixed with considerable rain and humidity and temperature changes throughout the day. Carricante 100%. The vines are bush trained. They plant at high density with 9,000 vines per hectare. Fermentation takes places in steel tanks at a temperature of 18-20°Celsius. This was a beautiful wine with a rich bouquet of flowers and fruits. On the palate it showed great acidity, minerality and the same aromas that were in evidence on the nose. It also had notes of bitter almond. Tenuta di Fessina, imported by Winebow, was founded in 2007 by winemaker Silvia Maestrelli, her husband, Roberto Silva, and winemaker Federico Curtaz. The Fessina Estate is located in the small village of Rovittello, and lies in the shadows of Mt. Etna, Europe’s largest active volcano. The vineyard that produces today’s wine, Etna Bianco A’Puddara 2011 is the Contrada Cavaliere vineyard. The soils there are a combination of volcanic soil and sandy-Loam. The vines are bush-trained. They are planted at a density of 2,400 vines per hectare. The wine is also made from 100% Carricante. It ferments in stainless steel tanks and undergoes a long maceration, 2-3 days. It ages in 35 hectoliter French oak barrels. I tried this wine at the Tre Bicchieri and also at Vinitaly last year. I loved it. It was lush, sensuous, and complex with great acidity and the mineral notes that I favor. Here is a nice article, albeit in Italian, on the winery from Wining.it. Both wines are widely available in the States. Definitely grab a bottle to try and I guarantee you won’t be disappointed.